In this unit we will be spending time exploring how to use colour in design, we look at different colour blends, we see how texture influences flower arrangements. You will create designs using scale and proportion and learn how form and space enhance designs. This is a perfect course for beginners or anyone wanting to be updated on current principles of design. The course gives you hands on practical tasks so that you can visually see how to implement design skills into your flower designs. What we will cover over the course. We will be studying colour, texture, form, space, line and combining this with direction of movement/ rhythm of line through design and the mood it creates. We will explore focal areas of dominance and where they appear in the container i.e. origins of growth and how many you use. Look at texture – source and create textured squares, look at how it creates contrast or blends, and competes with colour. Explore how colour is formed and see the effect of lighting on colour. Investigate proportion and scale of design – in 3:5:8, 1/3 to 2/3 direction of proportion, and form and line in design. Taking a design from: Decorative, Form Linear and Vegetative. Explore balance – Symmetry and Asymmetry. You only need to complete this unit once, either when completing level 2 or 3. The British Academy of Floral Art is a top UK floristry school and is the place to train if you want to become a successful florist/ floral designer or just have the experience of a creative floral journey. You have the opportunity to follow the success of our past students who have achieved  RHS Gold medals, set up their own successful businesses, either freelance or shops, or go on to become floristry teachers, judges or demonstrators. We explore modern and current trends as well as traditional methods. World class qualified teaching team with experience of over 18 years. Who recognizes you as a school? We are a British Floristry Association (BFA) Institute of Professional Florists (IoPF) College member. We have a tutor on the BFA education board. Plus we are a City & Guilds accredited center. What will I be able to do once I have completed this course? Flower Arranging- we offer a range of tasters floristry and flower arranging workshops and courses which are designed for you to learn floral skills to decorate the home. Floristry Level 2 – you will be fledgling Florist, giving opportunity to create everyday designs either as a freelance florist or  give you the opportunity to work in a shop. Plus you can move on to our level 3. Floristry Level 3 -you will be an advance florist capable to making a wide range of floristry orders, have a greater understanding of your individual style and the floral industry and from here you may want to establish your own business. Access to C&G level 4. Floristry Level 4-  City & Guilds you will have the title of Higher Diploma in Floristry (ICSF) which will enhance your design ability and support you in business, manager level in a shop, teacher, demonstrator, judge. Floristry Level 5- City & Guilds Master Diploma in Professional Floristry (MDPF) highest level achieved, giving national recognition as a top floral designer, teacher, business owner or high level manager. What will this courses include? Practical lessons that are supportive and friendly that give you  tuition and clear demonstrations of design construction and techniques, covering a full range of current commercial and floral designs. What happens if I can’t make a lesson? To successfully complete the course it is important to attend all lessons. If through unexpected circumstances you have to miss a lesson please let your tutor know as soon as possible. No refund can be given for missed classes; however as a gesture of good will we will endeavour to offer you an alternative date to catch up the missed lesson when the unit is repeated; this is subject to application and availability. It is the students responsibility to organise this date with the Academy. If the Academy has to cancel a lesson for any reason, we will ensure that you are given an alternative date to catch up the missed class. What will I learn besides the floral designs? At level 2 – Flower and foliage names, poisonous and irritant plants, costing, customer care, buying, ordering, care of flowers and elements and principle of design. At level 3- Banding, costing for your business, environmental concepts, applying design skills and inspiration from abroad. Corporate clients and customer care. At level 4- Business and marketing studies, historical influences, botanical science and event planning. At level 5 – Running a business including laws and legislation , accountancy, people management, plant science and international studies. How do the professional floristry your courses work? We have split the professional floristry courses content into subject units, these can be taken individually or built up to into a full qualification. Level 2 – 3 practical units, the heart of design unit and pass the practical exam unit. Level 3 – 3 practical units, the heart of design unit (if not taken at level 2) and pass the practical exam unit. Level 4/5 – 5 practical units and exam unit- 3 years from registration to complete course. Are your floristry courses flexible? There is no time restriction on completing the full level 2 and 3 and you pay for and complete one unit at a time. The flexibility of the course helps to support your personal floristry journey  and build around your life style and business. Level 4 and 5 City & Guilds needs to be completed within 3 years of registration. Is there a lot of written paper work or assessment? Our level 2 and 3 practical units have been designed so that there is no written paper work or classroom assessment. To develop your skills and confidence as a florist the units are hands on and practical. To enhance your knowledge we cover theory  and costing in the class through discussion and hand-outs. There is an final practical exam if you would like to achieve the full qualification. Level 4 and 5, City & Guilds there is an equal balance of written and practical work, to achieve each unit you have to pass the set assignment or assessments written by City and Guilds. To achieve the full qualification there is a theory and practical timed exam. Theses recreational classes have no course work or paper work, just pure practical and demonstrations. The classrooms provide a creative space for you to relax and enjoy your course. The classes are small with a maximum of 12 students on our professional courses  so you have plenty of one to one with the teacher. Tea/ coffee is provided free of charge. Plenty of free parking at our venues. (Our recreational flower arranging classes may at some venues have a maximum of 20 per class). Level 2 and 3 – On the completion of each unit you receive a certificate of attendance. 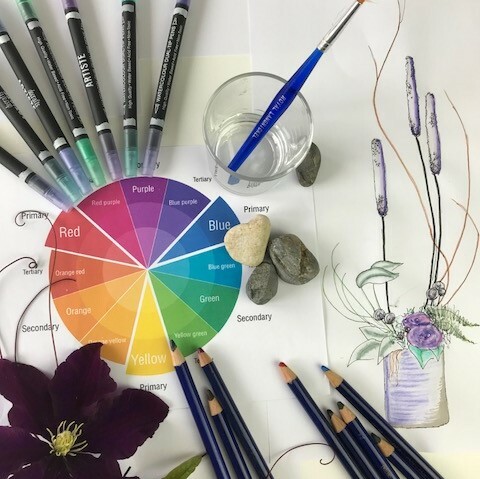 To achieve our full level 2 or 3  you need to complete 3 practical units, the heart of design unit and pass the practical exam unit, then you will receive an British Academy of Floral Art level 2 or level 3 certificate and a studied at the Academy pin for your website. Level 4 and 5- On completion of a single unit you may request a certificate of attendance. On completion of full units and passing of exam you will receive a City and Guilds Certificate and an Academy of Floral Art Master Training Program  level 4 or level 5 certificate and a studied at the Academy pin for your website. Yes this qualification is recognized  by our professional body the British Floristry Association (BFA)  and once qualified you  can become a member on their Institute of Professional Florist register. The level 2 and 3 is based on national floristry standards so that you can gain employment in a Florist. You can enter UK Words Skills and with our certificate you can carry on studying our Master training program City & Guilds Floristry level 4 & 5 ( which is recognized world wide). Full time fast track – 4 weeks. To give you flexibility you can do more than one unit at a time, which would reduce the amount of time to complete the course. When do your courses starts? You have a choice of start dates throughout the year, spring, summer and autumn. As a student you become a member of our Academy family with access to continued support via our private Academy student facebook group, where you can ask any question and have support from tutors and past students. Plus we will send you a newsletter keeping you up to date on Academy events, trips, workshops and courses that may benefit you. If this is the first time you have been with us or you are returning to complete another unit, we would like to welcome you to the Academy of Floral Art and hope that you find this an inspirational journey. Tea and Coffee provided, microwave and fridge available. See below directions and map. The easiest way to get to us is from the Plymouth road and when you get to the top of Haldon Hill on the brow of the hill you will see the sign to Dunchideock, turn off and follow the signs. You will go along the ridge of Haldon Hill, pass the Haldon Belvedere Tower and then start going down a hill, when you get out of the tree’s you will see a sign to the left for Dunchideock Barton, and Church, turn left here and head towards the church, when you get to the church you will see a court yard to the right, we are unit 8. 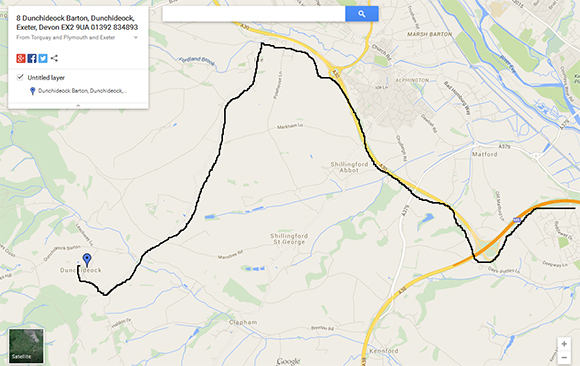 Alternative route from Okehampton Road below. 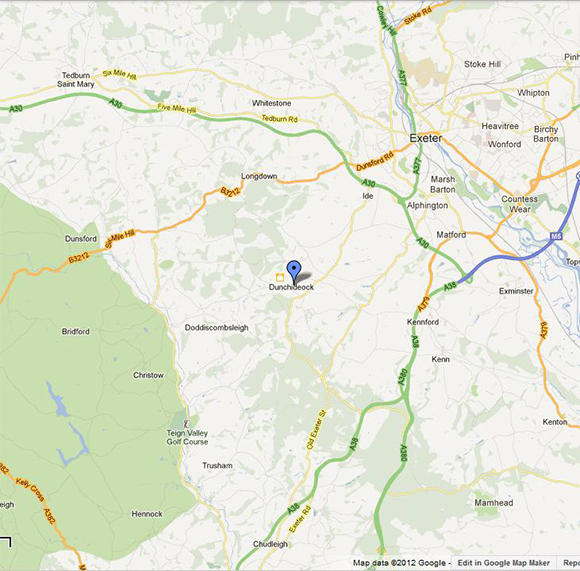 From M5 you can turn off on the A30 Okehampton Road, then take the first junction signed to Exeter, Alphington/ Ide, at the bottom of the slip road you will get to a big round about, take the first turning to the left signed to Ide, continue to A. Coming from Okehampton take junction signed to Exeter, Alphington/ Ide, at the bottom of the slip road you will get to a big round about, take the third turning signed to Ide, continue to A.
A=Follow this road until you see sign to Ide village then turn off left and keep on this road for about 7 minutes. Eventually you will start going up a hill and see a thatched house with pillars on the road, just after Lord Haldon Hotel entrance. You will see a big sign to Dunchideock Barton, turn right here and follow road to the Church, our studio is in the court yard to the right of the Church, number 8. There will be parking outside.